The shortfin mako shark, Isurus oxyrinchus (“sharp nose”), is a large mackerel shark. Along with the closely related longfin mako (Isurus paucus) it is commonly referred to as a “mako shark“. 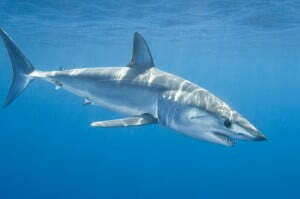 The shortfin mako inhabits offshore temperate and tropical seas worldwide. The closely related longfin mako shark, Isurus paucus, is found in the Gulf Stream or warmer offshore waters. It is a pelagic species that can be found from the surface down to depths of 150 m (490 ft), normally far from land though occasionally closer to shore, around islands or inlets. One of only four knownendothermic sharks, it is seldom found in waters colder than 16 °C (61 °F). In the western Atlantic it can be found from Argentina and the Gulf of Mexico to Browns Bank off ofNova Scotia. In Canadian waters these sharks are neither abundant nor rare. Swordfish are a good indication of shortfin makos as the former is a source of food and prefers similar environmental conditions. Shortfin makos travel long distances to seek prey or mates. In December 1998, a female tagged off California was captured in the central Pacific by a Japanese research vessel, meaning this fish traveled over 1,725 miles (2,776 km). Another swam 1,322 miles (2,128 km) in 37 days, averaging 36 miles (58 km) a day. The shortfin mako feeds mainly upon cephalopods, bony fishes including mackerels, tunas, bonitos, and swordfish, but it may also eat other sharks, porpoises, sea turtles, and seabirds. They hunt by lunging vertically up and tearing off chunks of their preys’ flanks and fins. Makos swim below their prey, so they can see what is above and have a high probability of reaching prey before it notices. Biting thecaudal peduncle can immobilize the prey. In Ganzirri and Isola Lipari, Sicily, shortfin makos have been found with amputated swordfish bills impaled into their head and gills, suggesting that swordfish seriously injure and likely kill makos. In addition, this location, and the late spring and early summer timing, corresponding to the swordfish’s spawning cycle, suggests that these makos hunt while the swordfish are most vulnerable, typical of many predators. Shortfin consume 3% of its weight each day and takes about 1.5–2 days to digest an average-sized meal. By comparison, an inactive species such as the sandbar shark consumes 0.6% of its weight a day and takes 3 to 4 days to digest it. An analysis of the stomach contents of 399 male and female mako sharks ranging from 67–328 centimetres (26–129 in) suggest makos from Cape Hatteras to the Grand Banks prefer bluefish, constituting 77.5% of the diet by volume. The average capacity of the stomach was 10% of the total weight. Shortfin makos consumed 4.3% to 14.5% of the available bluefish between Cape Hatteras and Georges Bank. Shortfin over 3 metres (9.8 ft) have interior teeth considerably wider and flatter than smaller makos, which enables them to prey effectively upondolphins, swordfish, and other sharks. An amateur videotape, taken in Pacific waters, shows a moribund spotted dolphin whose tail was almost completely severed, with a very large shortfin mako circling the dying dolphin. Makos also have the tendency to scavenge long-lined and netted fish. Its endothermic constitution partly accounts for its relatively great speed. Like other lamnid sharks, the shortfin mako has a heat exchange circulatory system that allows the shark to be 7-10°F (4-7°C) warmer than the surrounding water. This system enables makos to maintain at a stable, very high level of activity, giving it an advantage over its cold-blooded prey. The shortfin mako’s speed has been recorded at 50 kilometres per hour (31 mph) with bursts of up to 74 kilometres per hour (46 mph). They can leap approximate 9 metres (30 ft) high or higher in the air. Some scientists suggest that the biochemistry of shortfin mako can swim up to 100 kilometres per hour (62 mph). Scientists are in debate exactly how fast the shortfin mako shark can swim, as well as which particular species are actually the champion ocean swimmers. This high-leaping fish is sought as game worldwide. There are cases when an angry mako jumped into a boat after having been hooked. This shark is highly migratory. The shortfin mako shark is a yolk-sac ovoviviparous shark, giving birth to live young. Developing embryos feed on unfertilized eggs in uterus during the 15 to 18 month gestation period. This is called (oophagy) (i.e. egg-eating). 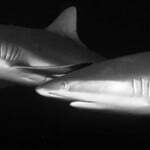 Shortfins do not engage in sibling cannibalism unlike the sand tiger shark (Carcharias taurus). The 4 to 18 surviving young are born live in the late winter and early spring at a length of about 70 centimetres (28 in). It is believed that females may rest for 18 months after birth before mating again. Last and Stevens (2009) report shortfin makos bear young on average every 3 years. Last and Stevens (2009) report similar findings.